Features:A comprehensive treatment against cockroaches, red/black ants and silverfish. This effective treatment is for the management of house hold pests such as Cockroaches, ants, silverfish and crawling insects. This treatment is based on the use of water based synthetic pyrethrums with a natural fragrance spray and non-toxic bait material. The treatment is carried out by spraying combination of insecticides (Herbal Insecticide / Chemical In secticide) in every crack and crevice of the premises to reach all the hidden parts so as to kill all the existing insects. The challenges posed by unfavourable climate changes, fungal growth, infectious pests and other forms of contamination are countered by a highly regulated and stress tested process of sanitization. 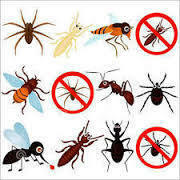 This treatment is primarily undertaken to eradicate the presence of pests which includes Cockroaches, spiders, Dust mites, Silver Fishes, Flies, Black & RedAnts and other such insects . (Except Bed Bugs & Mosquitoes). We are providing Disinfestation Service for all Commercial and Industrial spaces. - Disinfestation Service is a term used for treatment of several types of pests and those pests commonly found in most situations. We are actively engaged in offering an extensive range of General Dis Infestation Service for catering the diversified requirements of our clients. These services are famous for high flexibility and client focus approach. Apart from this, these treatment services are available within the requested period of time. Household pestlike cockroaches bed-bugs, silverfish, cricket spiders, blackants, lizards etc are effectively controlled by carrying out this service regularly at suitable intervals under mutually agreed contract. To meet the varied necessities of our customers, experts are proficient to offer Disinfestation Services. Our experts finish this service by employing the advanced technology. This service is extremely admired by customers due to their timely implementation and reliability. We are capable to offer this service in diverse forms that meet our consumer’s demands. Insects are a major pest of hostels, restaurants, homes, offices and other commercial areas. even apartments. Their bites cause irritation and even allergic reactions, while the stigma associated with their presence can cause a lot. Not known to be vectors for disease even though they are known to carry disease organisms.